Once I had finished dealing with Thomas, I returned to the real world to deal with him there. I still had the matter of his body to take care of. I had sent the keep's pages out to spread the word that anyone wishing to attend his funeral should come to the observation room over the heatstone at sundown that evening. Fortunately, Yoseph was gone by the time I returned to my room, so I wouldn't have to deal with him right away. For some reason, Dane was also making himself scarce, though right now, I didn't mind that either. I collected what little belongings Thomas had owned and placed them in a small wooden box. Much of it was borrowed training materials, though there was some clothing that he had been issued while at the Duke's castle. I also found the gold Imperial coin that I had paid him before my capture. He still had it. I kept that aside for myself. I'll take it to him later tonight. They say you can't take it with you, but in his case, I was going to make sure there was an exception. After returning Thomas' borrowed items, I took what little remained and passed it out amongst the other squires that he had talked about. It made little sense to keep the clothing for myself. Besides, it would help his friends to have something to remember him by. After all, they couldn't just pop into the spirit realm for a visit like I could. Last on my list, before I could try to relax for the day, was to check out the maintenance balcony over the heatstone. Normally, one would have to wear special garments with a spell woven into the fabric to stand the heat. I wanted to see if the magic of the dragon was powerful enough to protect me without such requirements. The sorcerer, who was responsible for maintaining the keep's heatstone, as well as it's other base functions, had been most disturbed when the guards had brought Thomas' body to the observation window. He had been even more disturbed when I explained what I intended. From Gwen's memory, I knew that the stone's temperature could be driven quite high for very short periods of time. During the siege of Chasok Keep where Gwen had been temporarily trapped, they had used the stone to dispose of waste materials by incinerating it. I now intended to use the stone to cremate the body of Thomas. I had been nervous about entering the room, as the sorcerer had informed me that the temperature inside generally hovered around one hundred and eighty or so. If the power of the dragon didn't protect me from the heat, I would definitely be beating a hasty retreat. Curiously enough, I found the heat slightly oppressive at first, but then oddly relaxing. It reminded me somewhat of a Jacuzzi, where you're uncomfortable with the heat but soon become used to it and relax. I spent the next fifteen minutes just looking around the inside of the chamber with one of the workers following me in case the heat overcame me. The truly startling revelation came after we left the chamber. The technician had asked me why my eyes had changed. As it turned out, while I was using the power of the dragon to protect myself, my eyes had taken on his aspect. I wasn't sure if it was Lakash's way reminding me who's power I was using, or if it was purely a side effect. Either way, I wasn't going to let a small thing like the way my eyes looked bother me. Been there, done that. Rather than mope in my room, I went up to the top of the keep's walls. The day was cheerful enough, with light airy clouds floating by in the breeze. I could feel the harsh chill of winter coming, forcing the guards on duty to don heavy surcoats, though I had to concentrate to feel it anymore. One of the most intrusive things I noticed about the Dragon's power was the detached feeling I had of my surroundings. It was as if my sense of touch had been muffled under a huge pile of cotton. On the other hand, my sense of sight, smell and hearing had become incredibly sharp again. I remembered the boost that I had gotten when I was a bear, and it had been nothing compared to the raw input I was getting now. It was so difficult to concentrate sometimes. I not only had to tone down my hearing so as to concentrate on just the person I was with, but I also had to keep my mind on where I was and what I was doing. It was so easy to find myself watching Zig Zag or Sabrina going about their daily life and tuning out my current surroundings. I wondered what the significance was that I would think more about those two than I would Sheila. Maybe it's true what they say about absence making the heart grow fonder. I know I definitely missed Zig Zag's company. At the moment I was content with leaning on the stone ramparts and watching the clouds float by. Not that I was looking for anything, I was simply trying to loose myself in the slowly changing shapes as they meandered leisurely on the currents of air. There truly is no rest for the wicked or the weary. The sound of Gwen's tentative voice came from behind me, "Arden?" I let my ears wilt at the thought of what our conversation would undoubtedly be about. "Yes, Gwen." I answered back, softly without turning. The touch of Gwen's hand on my shoulder destroyed any remaining fragments of solitude that I had left. "Arden, can we talk? Please?" she asked quietly. I closed my eyes and let my muzzle rest on my paws. "We are talking, Gwen," I replied without too much sarcasm. Gwen moved to stand next to me and leaned against the rock. "Please, Arden. You know what I'm talking about," she implored quietly. "I'm worried for my sister." Ah. There you have it. The crux of the conversation. I knew she'd be coming around to beg for her sister. I opened my eyes and looked at her without moving my head. "As worried as you were when she sent her real elite to try to kill me?" I asked in a low voice. She got a pained look in her face as she turned away slightly. I straightened up and turned to face her with a stern look. "She tried to kill me and as a result, Thomas now lies dead." "That's not fair," she said quietly. "I didn't know about that." Gwen turned back and looked me in the eye with a wide, sorrowful expression. "I swear, Arden, I didn't know. If I had any inkling of what she had planned, I would have warned you, I swear." For a moment, I was tempted to let my anger prod me into doing something cruel, but I knew deep down inside that what she said was the truth. Despite any loyalty she owed her sister, I knew for a fact that she was telling the truth. We were too close to each other to lie without knowing. I nodded my head, ashamed of myself. "I know, Gwen. I'm sorry." Gwen looked like she wanted to ask something. A couple of times she started to say something but bulked before she finally asked, "What's going to happen to my sister?" I let out a low growl as I turned back to the clouds and rested my muzzle on my paws again. "Do you mean what would I do, or what will the Arcanum do?" I asked. "I know what you'd do," she said quietly, "and I can understand it completely. But she is my sister, Arden." I let out a sigh as I thought about her sister and the memories from Gwen that I held of her. The more I looked through their youth, the more assured I became that her sister didn't care about anyone or anything except herself and her pleasure. "Gwen," I said with flat, emotionless voice, "You don't have a sister, you have a leach that's sucking the blood that ties your family together dry." "Arden!" she exclaimed, shocked at my declaration. I turned at looked at her while keeping my emotions from my face. "I know evil when I encounter it, Gwen, and your sister is evil," I stated flatly. "I have met the Prince of Darkness himself, and your sister would make a good match for him." Gwen stared at me for a second before she shook her head as if to clear it. "Who is this Prince of Darkness you speak of? Are you talking about Prince Hiram?" she asked somewhat confused by the turn of the conversation. I laughed at the thought of that little twit being compared to Lucifer. "No, Gwen, he is not the prince I speak of," I said with a small smile that quickly faded. "I speak of none other than Lucifer." There wasn't a hint of recognition. "Beelzebub?" Gwen just shook her head. 'Try Nalboljia" I heard Illiam say. "How about Nalboljia?" I asked, taking my prompt from the dragon. Gwen backed up as she made a mystical or religions pattern in the air with her hand. "Arden!" she exclaimed. "You've had dealings with Nalboljia?" I ignored her outburst and leaned my back against the rough stone. "Know thy enemy, Gwen," I responded casually. "And, although he is one of my enemies, we both have a greater enemy that I must defeat." She looked at me with an expression of shock and horror. Gwen had never imagined that I would be dealing with the likes of him. "And that's supposed to make it all right?" she asked in disbelief. "Arden, you risk your very soul dealing with one such as him." I looked away and stared at the stone I was standing on for a second. "My soul's already lost, Gwen," I replied in a hushed tone of voice. "I have killed too many people to go elsewhere." "That's not true, Arden," Gwen said as she stepped back over to me. "You're too good of a person deep down inside for that to be true. Don't believe what one such as he tells you. You're soul isn't lost." I looked back up at the setting sun and sighed. "It's time, Gwen," I said to change the subject. "We both have a duty that calls for our attention." Again, Gwen looked like she wanted to argue with me, but changed her mind. "As you wish, Arden," she said. She turned to walk away, stopped then came back and gave me a light kiss on the cheek before she left. I watched her as she walked towards the stairs leading down into the keep. She was the closest thing to a sister I had in this or any world, and it was going to be my duty to see justice was done to her sibling. I sighed and rubbed the bridge of my muzzle. I was beginning to get a headache from all the stresses of the day and the need to deal with Thomas' funeral wasn't helping. I still needed to track Sheila down. I had been looking for him when the clouds caught my attention. I was slacking and still needed to find him. It was time to cheat. "Illiam? You around?" I asked to the air. "Of course, Arden," the disembodied voice came back. "Do you know where I can find Sheila?" "Sheila is at the top of the north tower." What was he doing up in the north tower? From my recollections, or rather Gwen's recollections, that place was being used as a storage site right now. A long time ago, it had been used to house very important prisoners, but hadn't been needed for that in a long time. I took one last glance at the sun as it neared the horizon before I went to fetch Sheila. The walk up the tower was a long one. The dust lay thick on the stone steps except where they had been disturbed by Sheila's boots. From the looks of things, nobody else had been in here for ages. At each level I found thick, wooden doors that lead into fairly respectable sized chambers. Each was lockable from the outside and had a small viewing door at head height for the jailers to look through. As I glanced into the rooms, it was obvious from the dust that nobody had been in them for a long time. The final and uppermost doorway was open, leading into a room that occupied the entire top floor of the structure. I followed the footsteps as they meandered through the room until I spotted Sheila as he sat on the edge of the window, gazing out at something unseen to me. "You know, Arden," Sheila said without looking. "I could hear you open the door at the base of the tower. All the way up, I've listened to you stop at every door and look in." He turned to look at me for a second before returning his attention out the window. "Now I understand why you called these abilities a curse." I walked over to him and wrapped my arms around him from the rear. "Don't worry, love. You won't have to put up with them for much longer," I replied in an attempt to soothe him. Something was definitely bothering him, and I had the feeling it wasn't the dragons powers. "Soon enough we'll get the Chro'nisforum and be on our way to Husquahr. But first, we have duties we must attend to. It's time for Thomas' funeral." Sheila took a deep breath and let out a wistful sigh. "I'm not going," he finally said in a quiet voice. I let go and straightened up in surprise. "What do you mean, you're not going?" I asked incredulously. Sheila shook his head as he restated, "I'm not going, Arden. I can't." I moved around Sheila and sat down next to him on the windowsill, facing in towards the keep rather than out. "Sheila, what are you talking about? Why can't you go." He didn't look at me. In fact, he made it a point not to look in my general direction. "I'm sorry, Arden. I just can't. Please, don't ask me to do it," he replied with a slight pleading tone in his voice. "But Sheila, he was our friend!" I stated as a rebuttal. How could he do this? Sheila's head whipped around to face me. "No he wasn't! He was your friend, not mine!" The venom in his voice startled me enough that I banged my head against the wall with the shock. I just stared at him in disbelief while I tried to glean some bit of reason behind his reaction. I never even had a clue that he felt that way. 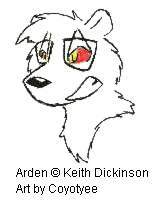 Sheila's expression softened a little as he continued, "I'm sorry Arden, but that's just the way I feel about it." He got an embarrassed look on his face and turned away again to lean against the stone windowsill. I slumped against the wall as my strength abandoned me. "I had no idea, Sheila," I said quietly. "Neither of you ever gave me any indication..."
He sat there quietly for a second watching something outside the keep. "You've got to understand, Arden. Before we came here, you were always there for me. You were my best friend, my lover and companion." He turned and got more comfortable with his back against the sill and continued his explanation. "Since we got here, that kid's been around you almost all the time. You've paid more attention to him than everyone else combined." As he talked, he got more agitated. "That damn kid has monopolized your time from the start of the day to the end. The only private time I ever got with you was at night, and even then only when you told the rug rat to get lost." All I could do was stare as I watched him bang his head against the stone. His face was filled with anguish. "Damn it Arden," he said as he gasped for breath, "I was jealous of a kid. Do you understand me? A kid! What kind of a damn fool is jealous of a stupid, pubescent kid?" I had no answers for that. I couldn't even imagine what he must have been going through. It was too much for me to absorb all at once. I had constantly run into Sheila's jealousy and distrust before we had been transported into this world. What kind of a fool would forget all about something like that? I took a deep breath and tried to calm myself a little before I responded. "I can't claim to know what you're feeling because I've never been there," I said gently. "I'm not the jealous type. If I were, I don't think I could have stood the thought of you working at the studio after we got together." I paused for another breath and to think about what to say. "I know you've been hurt by a lot of guys that promised to be there for you and then dumped you. I know that's caused you a lot of scars. And I can see how that could have affected your attitude towards Thomas. But the fact remains that I still need you to stand by me at his funeral." Sheila shook his head in denial. "I just can't do it. It wouldn't be right. How could I stand there and pretend to have been his friend when I wasn't," he said in a hushed whisper. "You mean like I did for Bjorn?" I asked back. That got his attention. "Bjorn and I weren't friends. I never liked the little rodent from the day I found out he'd screwed you knowing that we were a couple. And yet, I stood before a gathered crowd of his friends and admitted my feelings for him and what I did respect about him." I reached out and took Sheila's hand in my paw and gave it a squeeze. "Can you honestly say that there was nothing about Thomas that you respected? That he never did anything that you approved of? Could you truly have hated him so much that he could do no right?" I let the question linger in the air for a minute. Sheila looked like he was mulling over what I had said. I decided to let things be. Either he'd come, or he wouldn't. I wasn't going to force him. I gave his hand another squeeze as I leaned forward to give him a gentle kiss before I hopped down from the windowsill. I paused at the door on the way out to look back at Sheila. His face was ruddy orange like the color of the setting sun. I could only try to imagine what was running through his head right now, and that was something I really didn't want to do. With a sigh, I slowly started down the stairs on the long journey to the heatstone. Only time would tell if Sheila would show up or not.